Big, boozy stouts tend to be expensive, and a lot of drinkers regard them as seasonal treats, so they're not among the most popular beers from a straight sales perspective. 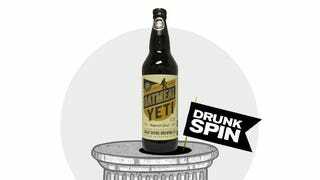 But if you brew a stout with an alcohol-by-volume percentage over eight and give it a price tag north of $7 per 22-ounce bottle, you've virtually guaranteed it high marks in the popularity pageants adjudicated by the weirdoes whose preferred drinking companions are smartphones dialed into Untappd, Beer Advocate, and Rate Beer. People will sometimes ask how to follow me on Untappd—a semi-social beer-ranking app—and the boring truth is that I don't use it. I don't think it's a bad service or anything, but I tire of having my social-media feeds crudded up by endless lists of who checked in where to drink what. Hey, look, Mikey's having another Bud Light, earning him the Grown Men With Little Boy Names Who Have Sucked Down 1,000 Bud Lights This Month badge! I don't really care who's drinking what at any given moment, nor would I expect anyone to care what I'm drinking myself. But that said, Untappd is a perfectly valid business, because it brings a lot of people joy and does no real harm to the rest of us. Same goes for Beer Advocate and Rate Beer. We've poked fun at BA a few times for the stridency of its users—the message boards can get a bit pretentious, and you'll never meet a community of people more eager to tell you what shade of off-white the lacing on their beer foam is—but those folk, by and large, know a ton about beer, and the site's sheer size makes it a very useful database, if nothing else. I tend to prefer Rate Beer, because the layout's a little cleaner, and they contextualize their rating system by telling you not just a beer's raw score, but also where it slots in among its peers. Beer Advocate simply tells you that Schlitz's aggregate score is 81 of 100, whereas Rate Beer users award it just 18 points overall, but the site notes that this places it in the 95 th percentile of the pale lager category. Great Divide is a well respected brewery in Denver (I ranked their Titan IPA second of 14 high-class ones I tried in June) that's perhaps best known—at least on the East Coast—for their Yeti line of imperial stouts. They've got plain Yeti, Espresso Oak-Aged Yeti, Chocolate Oak-Aged Yeti, Barrel-Aged Yeti, and the one we're tackling today, Oatmeal Yeti. They all, of course, get high marks on all the rating sites, because they're good beers and because of the aforementioned price/ABV/style prejudices baked into the scoring systems: Oatmeal Yeti gets a raw score of 99 on Rate Beer, which somehow only places it in the 93rd percentile of imperial stouts. People really like gigantic, pitch-black beers. And that's cool; we're all people here. Oatmeal Yeti set me back about $9 for 22 ounces. It's black, and 9.5-percent ABV. It's distinguished from its fellow Yetis by the addition of rolled oats to the grain bill and a bit of raisins in the brew kettle. It smells like the world's best version of a Devil Dog, chocolatey and creamy, with the raisins adding just a touch of dark fruit to the roasted malt. The taste is super smooth and soft, with none of the bite often associated with high-proof imperial stouts; I'd have guessed the ABV to be closer to six than the actual 9.5. This gentleness in the face of nearly wine-strength alcohol is an impressive engineering feat and a testament to the brewer's skill. The oats add an extra dimension of grainy sweetness on top of the typical chocolate, and they soften the roasted malt enough to allow the latent caramel notes to emerge from beneath the bitter coffee, making this more interesting and nuanced than the standard imperial stout. A touch of piney hops on the long finish makes the bitterness as complex as the sweetness, which is why Great Divide Oatmeal Yeti earns all the high marks it receives, including the coveted "Wicked Good" on Drunkspin's proprietary ranking algorithm that accounts for, among no other things, my opinion of this beer. Get some.